LiveWave Antenna Reviews - Is It a Scam or Legit? LiveWave is a unique TV antenna that claims to harness the power of your home’s electrical system to create a power antenna thousands of feet long. LiveWave Antenna is an HD television antenna that plugs directly into your wall and has the ability to transmit multiple local stations in your area. The antenna’s unique shape is what makes it quite different than competing antennas that tend to be square and feature telescoping metal receptors. The company selling LiveWave is Swell Ecomm Enterprises, a fact that we found while skimming the terms-and-conditions fine print. The company also sells MindInsole, a series of foot care products that focus on compression therapy and dynamic shoe insoles. Both the LiveWave and MindInsole are As Seen on TV products. We’ve researched dozens of TV antennas and nearly all of them claim exactly what this one does: to bring you HD channels for free. Basically, you put the antenna in your outlet and then connect the coaxial cable that comes with your order into your TV and the antenna. After this, search your TV’s setting for the auto-scan feature, activate it and wait a few minutes while your TV uses the antenna to search and store local TV stations. Once the scan is complete, you can watch TV. 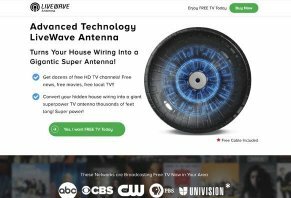 What makes LiveWave different from the typical HD antennas we’ve seen is that they say you can turn your home’s electrical system into a giant antenna by plugging this antenna in your home. We called around to about a dozen TV installation businesses across the country and a Best Buy in Jacksonville, FL. Some of the people with whom we spoke said they’ve never heard of a plug-in antenna that turns your home’s wiring system into a giant antenna. One shop owner we spoke with – an antenna installer in Central Florida – said it’s possible to use your home’s ground system as an antenna but that he’s never seen an antenna do it. He told us you run the risk of electrical complications and that he wouldn’t install it in his home. We believe that this conflicting information indicates that the jury is still about regarding the LiveWave’s ability to turn your home’s wiring system into an antenna. Now, that being said, we want to point out that HD antennas are only able to provide your TV with local free channels. They cannot capture premium channels like HBO, ESPN, Bravo and other channels you’d have to pay extra for in a cable package. Also, how well your antenna works has a lot to do with where your home is located in relation to TV towers and obstacles like trees, buildings, and walls that could impede the TV signal coming into your home. One other factor to consider is that TV antennas are tuned to very specific frequencies that allow you to get local TV stations. One expert with whom we spoke who chose to remain anonymous said that one potential drawback of the LiveWave is that the electrical wires your antenna connects to aren’t tuned for TV stations. Therefore, this method of turning your home’s wiring into a giant antenna may not work as well as you hope. In addition to buying an antenna or antennas, you can choose to purchase a lifetime warranty for $9.22. The fine print says that the warranty covers your antenna if it has defects in materials or workmanship. If the antenna just stops working one day, then, in theory, you can make a warranty claim. However, if you spill water on the antenna or break the device through an accident or negligence, it won’t be covered. “Damages due to improper care or accident may be repaired at a reasonable rate and a fee will be charged for return shipping,” the fine print notes. Basically, if you want to make a claim, you have to send the antenna back and the company processing the claim will inspect your LiveWave and determine if you’re eligible for a refund or exchange. In our opinion, purchasing the extended warranty is a bit of a gamble because you won’t know if your warranty claim is approved until the company tells you it is. If they deny your claim, you lose out on the money you paid for shipping, which will most likely cost around $5. As for returns, you have limited options. You won’t get a refund because the product is sold as-is. However, you have 30 days to request an exchange or store credit in order to get a new antenna. To start the return, you’ll need to email support@getlivewaveantenna.com. To give you a sense of how this antenna’s pricing and features compare to popular HD antennas, we went to Amazon to find out which HD antennas got the highest ratings from consumers. Both of these antennas received excellent reviews from customers and both are significantly cheaper than the LiveWave. Also, we noticed that both of these antennas are amplified, which means you can plug them in and boost their range to more than 35 miles. If you live in a rural area where the closest TV towers are more than 35 miles away, this can be a big benefit. In general, we’d say that the two antennas on Amazon present better value because they’re more than $10 cheaper and, unlike the LiveWave, their technology is traditional and widely understood to work well if you cut down on the obstacles between your antenna and the HD signals you’re trying to capture. There’s a chance that the LiveWave could work better because of its claim to use your whole house as an antenna but we don’t feel comfortable backing that claim based on what various experts told us during our research of this antenna. The Final Word: Is the LiveWave Antenna a Good Choice? This device is intriguing because of the antenna power it claims to harness simply by plugging it into a wall outlet and then connecting it to your TV. What’s missing from the product's website, though, is details about the antenna’s range and further explanation as to how it harnesses your home’s electrical wires to create a massive antenna. Because vital information about how the antenna works and because its price tag is higher than competing antennas, we think that there’s a certain amount of risk involved in buying the antenna. If you’re comfortable with that risk, this may be a good fit. However, if you’re looking for an antenna based on widespread technology that costs less than $25, we believe there are plenty of viable options on Amazon and at Target and Walmart. This item is a waste of money, it does not work. I followed the instructions to a T and still nothing, not one channel. I have tried to contact them to return my item and get my money back and no response from anyone. If you have paid with PayPal, they will get your money back, you just have to go through PayPal. This is a joke and a scam. DO NOT BUY. This product is crap. Didn't get a single channel and when I tried to return it they kept giving me things to try, which never worked. When I asked AGAIN to return it, they told me I had exceeded the 30-day return policy so I couldn't return the 3 that I purchased. I told them I had tried to return them within the 30-day time frame and they refused to give me the info I needed to do so. They still refused to let me return them, so I completely wasted my money on this product. I have been scammed...sold a piece of junk. Not worth any more of my time to try and get these crooks to return my money. There should be law against such lying companies like these. Buyers beware, if it sounds too good to be true it most likely is too good to be true. No stars for being a good product, 5 stars for being a successful scan and steal peoples money. I should have checked out the reviews before I bought this junk. But they were slick and did not ship orders until their coffers were full. So now people know it's crap. But haha, they already have your money. And they are laughing on the way to the bank. They should be locked up for it. Hi James. We are sorry to hear about this feedback. First, we would like to assure you that this is a legit entity - we are not in the business of scamming people as we know how hard earned money is. Second, we'd like to offer our help so you can maximize the functionality of this antenna. Connect the other end of the coaxial cable to the coaxial connector on the receiver. We should all do a tort lawsuit, they know this is a scam. I bought one, got it in just under two weeks, and I live next to two cities. I should have a ton of channels as advertised. I'm not even receiving one channel, it's not picking up anything. We should ban together and sue them. I don't care if I get my money, I just want to sink these people. Just robbing people, getting rich. They need to pay, they need to go broke so they can never do this again. I am so tired of this world today, every darn thing is a scam. I will report them. And I will plaster this LiveWave scrap on Facebook and do my part to do anything I can to save as many people as I can from this junk product. Sad part I was excited to try it out. I never not research things before I buy and the one time I do these people got me. Hi Aaron. We are sorry to hear about this feedback. First, we would like to assure you that this is a legit entity - we are not in the business of scamming people as we know how hard earned money is. Second, we'd like to offer our help so you can maximize the functionality of this antenna. Junk, plain and simple! I bought this before I read reviews, my own fault. I had bought two of the advertised antenna (buy one get one free) for $9.95 + shipping, that you stick or hang in a window. They work great, they each get 63 channels, all local stations like ABC, NBC, CBS, FOX, CW, and all the other stations like GRIT tv, etc. So why did I buy this thing from LiveWave? Well, 3 of our bedrooms are on the east and south side of house, while all stations are being broadcast from the west and north. I thought that if this worked as advertised then I could get local stations in those rooms without laying cable all over the place. Live and learn. I feel this company is a scam because if it is using whole house wire it would not matter where TV stations were being broadcast from. Save your money and get something other than this. Do your homework and you will not get ripped off like me. Hope to have informed you sufficiently. I received the LiveWave 2 and 1/2 months after I ordered. Will not pick up any stations at all. Walmart antenna picks up 42 stations. This is a scam. I spoke with someone at LiveWave and they offered a 30% discount. I told them I wanted a full refund. They actually told me to give it to a friend or family member. I told them, why would I give a gift to someone that doesn’t work? I shipped back the antenna and I am giving them a few days before I dispute my credit card charge through USAA. DO NOT BUY! 100% will not work! Hi Corey. We are sorry to hear that the antenna did not work for you. The number of channels you can receive depends on your distance, location, and environment in relation to your nearest broadcast tower. We'd also like to assure you the 30-day Money Back Guarantee which entitles you to a full refund of an unsatisfactory product as long as it is returned to us within 30 days from the delivery date. Once the returned item is received and checked at the warehouse, a refund will be issued to the original form of payment and you will be notified about. We hope to have informed you sufficiently. This product was ordered in February but not received until April. The product and amplifier were put together per instruction, hooked to TV, but guess what? Does not work. The LiveWave Antenna is made like a child protection cover for an electrical socket so NO electricity is actually used making it, no more than a lie to the consumer. FRAUD, FAKE, piece of crap. Be warned, do not buy. Not to mention with a lifetime warranty upon return you can only receive 30% of what you paid and you pay the return shipping cost. The company will not send a return shipping label. I know you are excited to receive your order! Due to an overwhelming demand for this product, there is currently a delay in shipment. We are working hard to get your order shipped to you as soon as possible. We will receive new stock on the 28th day of March and from there, please wait 10-15 days for it to be delivered to you. I would like to offer you a 30% discount for the inconvenience caused and patiently waiting. An email will be sent to you for tracking details once the product is shipped. Can you please confirm your shipping address, so we can verify that the order was sent to the correct address? I’m sorry for the inconvenience and thank you again for your order and your patience. I understand where you're coming from. Unfortunately, there's a sudden change in shipment. The process should be, once we received your payment we will endorse the item to the courier and shipped to you. However, we didn't anticipate that this livewave will have a high volume of orders which didn't cover all orders. We will receive new stock on or before 3rd week of April and from there, please wait 10-15 working days for it to be delivered to you. Also, we are looking to have cash on delivery process in the future for instance like this. Should we go ahead with the 30% discount for the inconvenience caused and patiently waiting. SO, you decide for yourself. Is this a BOGUS company that just took me for $50.00? I would say yes lesson learned. I say FRAUD. Oh! By the way, I had to give them a star to submit my review. Otherwise, I would not have given even one star. Hi Kevin. We are sorry to hear about this feedback. We admit that there are delays on the shipping but we'd like to assure you that this is a legit entity, we are not in the business of scamming people as we know how hard earned money is. This concern has been escalated so we can prioritize the shipment of your order. We understand you have every right to be upset due to the long delay and we are doing our best to rectify the issue. We also suggest you respond to the last email Raven sent you since their team is waiting if you will accept the discount offered while waiting for the product. Thank you! I ordered three antennas and an amplifier that was shipped first and separately. I realized after the order came in that it used the electrical ground system in my home in order to work. The problem being the ground from my electrical outlets are not connected. I have no grounding in my home. I tried to contact for a refund by phone but got an answering machine. Did a PayPal dispute and got turned down for the three antennas ($73.75), but they would let me send the amplifier for a $34.99 refund, but the return address was to HONG KONG and would have cost more to ship back what the item was worth. I wouldn't buy anything from this company based on that. It's a total RIPOFF! Unethical and not trustworthy! Hi Kent. We're sorry to hear about this feedback. First, we'd like to assure that this is a legit entity, we are not in the business of scamming people as we know how hard earned money is. We do have a return address in the US. To make sure that all your concerns are addressed and straightened out, we have sent you an email to the email address used when you placed your order. We look forward to hearing back from you and settling things soon. Purchased this to get rid of our amplified rabbit ears. Product is made so cheap I am surprised it stayed together long enough to allow me to send it back. First problem was delivery, it never shipped until I notified PayPal of no delivery. Once I tried it, it found about half the channels my current antenna found. When I asked for a return process, they offered a discount to keep the product and asked me if I'd rather give it away as a gift to one of family or friends, seriously. I have the email if anyone doubts that they said this. Finally received a return address but yes, you guessed it, I have to cover the return shipping cost. I am waiting for the funds to be returned to my PayPal account. One very good thing about using PayPal for this transaction is if the seller does not refund the money, PayPal will help me get the money back! Hi Ted. We're sorry to hear about this feedback. First, we'd like to assure that this is a legit entity, we are not in the business of scamming people as we know how hard earned money is. The 30-day Monet Back Guarantee will also be honored as long as all the condition are met. An email has already been sent to you regarding the refund issuance. We sincerely apologize for any inconvenience this has caused you. I bought 2 of them. The wire is so short you cannot plug into the back of the TV and then plug the other end into the wall unless both are within inches of each other. I contacted them and all they said was go to the store and buy a longer cord - what? Also, I unplugged it and got the same channels so not sure it did anything. I opened the 2nd package and the cord was split in half. Horrible product, does nothing, total scam! I wish I would have read these reviews BEFORE I wasted my money! Do not buy this product! Does nothing.